Earlier this month Japan’s Ministry of Foreign Affairs announced the names of individuals that it would award its prestigious Order of the Rising Sun to. Amongst the names was the Red Circle author Roger Pulvers. 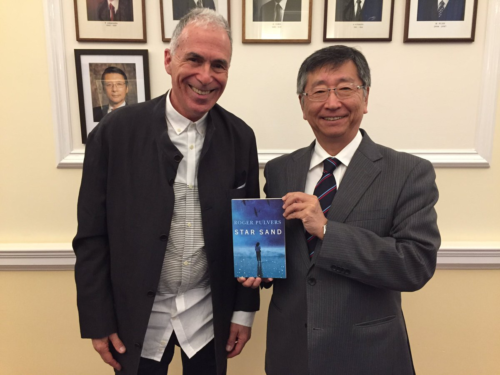 Roger Pulvers with Koji Tsuruoka the Japanese Ambassador to the United Kingdom, who is holding a copy of Pulvers’ novel Star Sand published in 2015. Pulvers’ latest work Tokyo Performance was published as a Red Circle Mini in November. The award known as Kyokujitsu-sho (旭日章 ) in Japanese was first awarded in 1875 by Emperor Meiji of Japan (1852-1912). The Order of the Rising Sun was the first national decoration awarded by the Japanese government and officially created on 10 April 1875. The medal features expanding rays of sunlight and its design symbolises both the powerful energy of the rising sun and Japan, the Land of the Rising Sun. 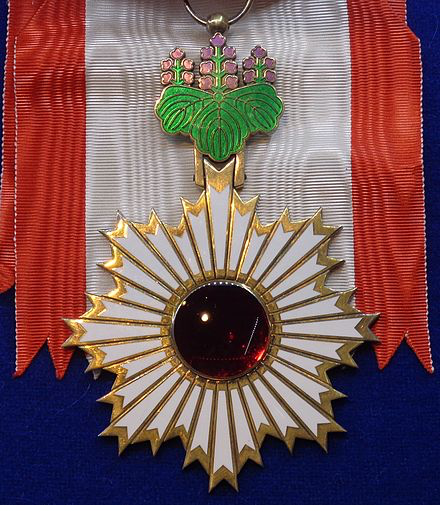 The Order is awarded to individuals who have made important contributions in international relations, the promotion of Japanese culture, advancements in their field of expertise, as well as to individuals who have made major contributions to social welfare or preservation of the environment. Pulvers, who has dedicated most of his adult life to Japan-related cultural activities, was awarded the class Gold Ray with Neck Ribbon. He will receive his award at a special ceremony on the 23 January.